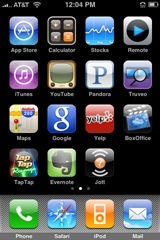 Geeks at Lifehacker has created a flickr group to upload and share iPhone 2.0/iPod home screens. Anyone can upload and their iPhone 2.0 home screens to this group. I explored the pictures and found quite interesting to see the different type of applications installed on iPhones. AIM, Twitterific, Google App, Google Maps and Facebook are the most common application that are installed on 80% of the iPhone. Visit Lifehacker’s iPhone 2.0 Home Screen Gallery to explore the images.